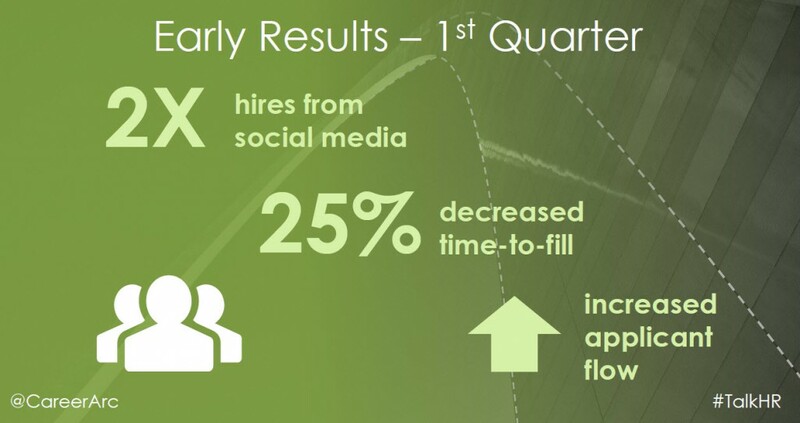 Are you looking to adopt social media to your recruiting effort? Then you may be your company’s next change agent. I’ve had the experience of being a change agent in several companies, and my role as VP of Talent Acquisition at Follett is no exception. 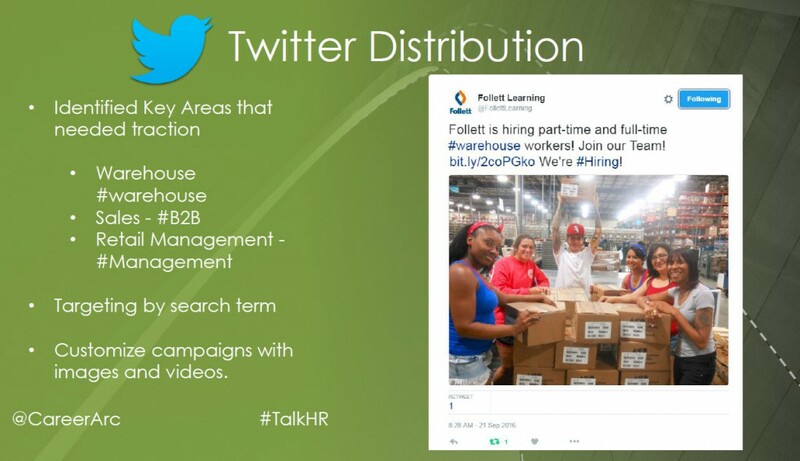 I was specifically brought on to Follett to turnaround the Talent Acquisition function, and the turnaround was significant: Our challenges at the beginning ranged from not having the right systems and processes in place, to addressing key areas that needed immediate and visible improvement–such as raising employer brand awareness and enhancing the candidate experience. change agent – n. someone who is employed by a company or organization to change the way in which it is organized and managed. You may be facing similar challenges in your organization or preparing to transform critical aspects about your department or company. My colleague, Matthew Krok, Manager of Talent Acquisition Technology at Follett, and I, along with our CareerArc Client Success Manager (CSM) Deb Kaplan Jacoby, partnered to deliver a CareerArc #TalkHR webinar. In it we shared our best practices on forging and managing this type of change, specifically developing a social media roadmap that co-exists and bolsters the talent acquisition ecosystem. I also covered pointers on the soft skills required for the job–such as how to gain consensus, secure and share our early wins, and build the necessary momentum to launch and sustain new initiatives and campaigns like social recruiting, employer branding, and candidate care. View the webinar recording and slides now to learn all 12 tips, but below are three of the most crucial, yet overlooked steps to achieving effective social recruiting adoption. Understand your business needs and illustrate how your strategy will fulfill the business gaps. In the webinar, I cover how my team and I devised a strategy that hinged on the central vision of our EVP, but that vision did not appear overnight. It was the product of the type of work that change agents are familiar with: Effectively partnering internally and meeting with key stakeholders to really understand business needs, and then crafting a strategy that addresses those needs. This is an important step especially for those like me who were brought in from another company to rework a specific function. Although it might be tempting to bring the successful blueprints from one organization to another, it would be a mistake to not understand and objectively evaluate your current business and its specific priorities. Also important to note is how “illustrating”, not “telling”, how your plan will fill the gaps is a key nuance. The more closely tied your proposed solutions are to the problems, the clearer it is to understand and accept that what you propose is not only desired but necessary for the business. The best way to gain consensus? Help leaders see that they are part of the solution. 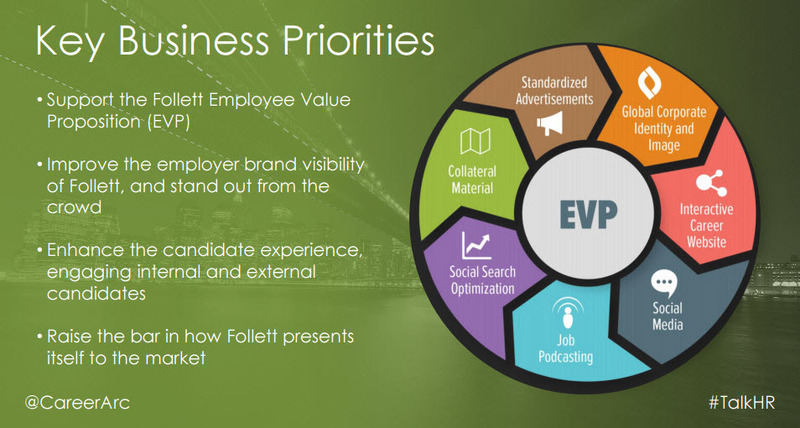 At Follett, we went on a Roadmap Presentation tour where we shared our vision with various leaders in the organization and emphasized the potential ROI from not only adding social media to our recruitment outreach, but also by building it into our Follett Talent Community portal, as well as supporting our other innovative campaigns like our soon-to-launch Job Podcasting feature. Showing what is possible and achievable truly is the inspiring work of a change agent, but it is the tempered and measured work of actively listening to concerns…and objectively weighing out alternatives that truly involve your leaders in the effort. Beyond the benefits of extending the social reach and awareness of our brand and talent community, we discussed with our leadership team how a social recruiting solution like CareerArc could achieve meaningful changes and process benefits to our hiring, including increased insight into applicant tracking, increased applicant flow, reducing time-to-fill, and shrinking cost-per-hire. Showing what is possible and achievable truly is the inspiring work of a change agent, but it is the tempered and measured work of actively listening to concerns, fairly addressing objections, and objectively weighing out alternatives that truly involve your leaders in the effort. Any questions raised about your plan can turn out to benefit your strategy and message as these questions help reveal new angles from which to view your plans, and also help you collectively set realistic goals and expectations as a team. Heavily publicize your wins and build excitement for what’s to come. Do you ever wonder why initiatives fizzle or why they are viewed as the flavor of the month? It’s often due to the lack of good publicity. To have a penchant for PR is perhaps the most overlooked skill in this process. Many of us are not accustomed to sharing our wins or goals openly, but if the purpose behind this publicity is done in the spirit of educating and energizing those involved for the good of the company, then sharing wins becomes a natural and impactful tool when introducing a new project, process, or paradigm. Introducing social media to our recruitment mix was an exercise in shifting paradigm and process, and initially some were naturally skeptical on how social media could improve our tried and true ways of traditional outreach such as email, phone, job ads, etc. To reassure skeptics and reaffirm commitment to the cause, we at Follett periodically sent out a little graphic images to involved leaders and team members explaining what we were up to that week which noted the purpose and potential ROI from the activity. I highly recommend that you create a weekly communications plan to remind everyone of what’s to come so teams stay focused on the potential outcomes that are worthy of the sometimes arduous work of change. What are your top tips for change agents? What are keys to your success in adopting social media to your recruitment effort? Irma Long has 20 years of experience in the Human Resources field, with specialization in Talent Acquisition. Long’s expertise is in building staffing models, programs, and process for Fortune 100-500 companies. Long regularly speaks at industry forums and roundtables, such as HCI, HR.COM, and Star Chicago, and is the author of the book, “A Practical Guide to Staffing.” She currently serves as the VP of Talent Acquisition at Follett Corporation. Connect with Irma on LinkedIn >>. Irma Long, VP of Talent Acquisition at Follett Corporation, shares how she and her team successfully adopted social media to her recruiting mix.